Beautiful Handmade Garden and Beach Umbrella With Good Antique Collection . The work done on them include Hand embroideries, beadwork, patchwork, sari vintage patchwork, mirror work and applique work. 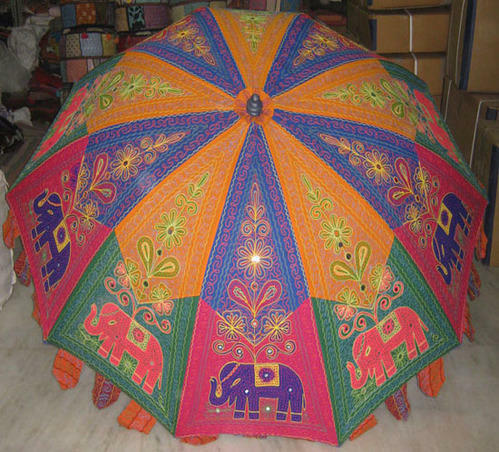 Decorative umbrellas in ethnic Indian fabrics are an idea to introduce new products. Garden Indian Parasols. Hand embroidered cotton, over a metal frame with a colour matching cotton lining underneath. All the parasols have a metal frame and angle adjustable pole. Stunning in every way, and big, 6ft in diameter and standing just under 8 ft tall.